Thumbwheel potentiometers are really handy when you don't have space on your enclosure for a knob and you still need access to a tuning or volume control. 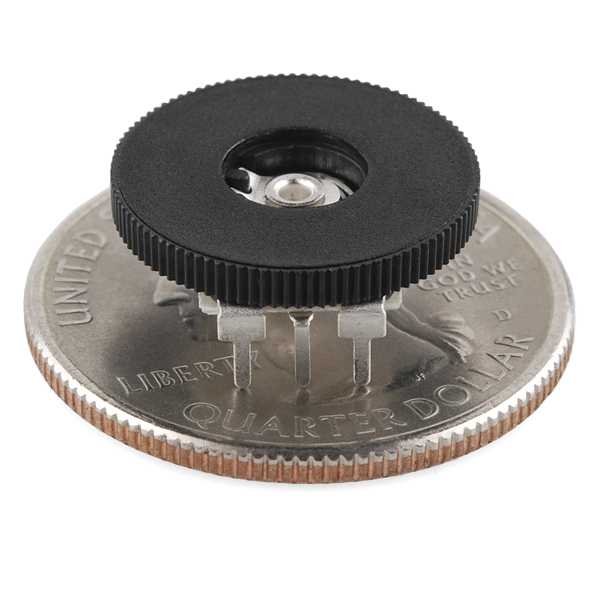 These 10k ohm linear potentiometers will mount into standard 0.1" pitch proto-boards. 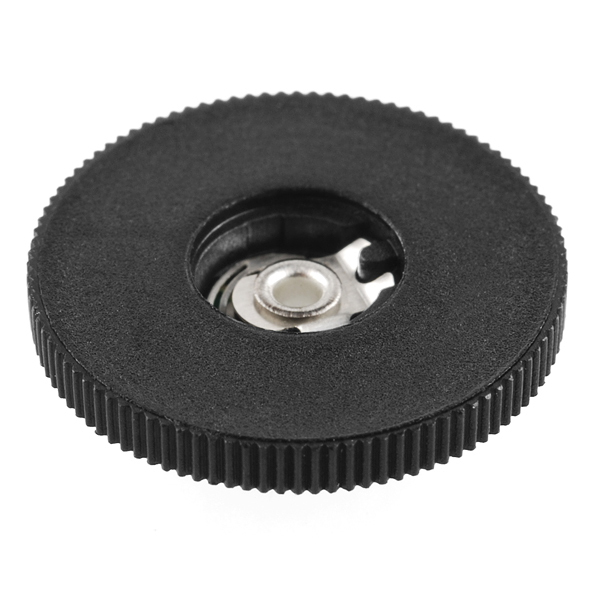 Does anybody know a source to get a 1M Ohm version of this thumb-wheel? Ideally from US. Thank you. That gave me a morning chuckle. Glad I'm not the only one frying parts. I was hoping these would snap into breadboards. The spacing is right, but the pins are just a little bit too short. "Proto-boards" in the description means through-hole. If you have a fairly good hand with a soldering iron, and stable mini-vise or similar holder for the pot; you can fix this by soldering clipped leads from through-hole parts or very short pieces of solid wire (~24 AWG) to the inner side (relative to the pot as a whole) of the pins. 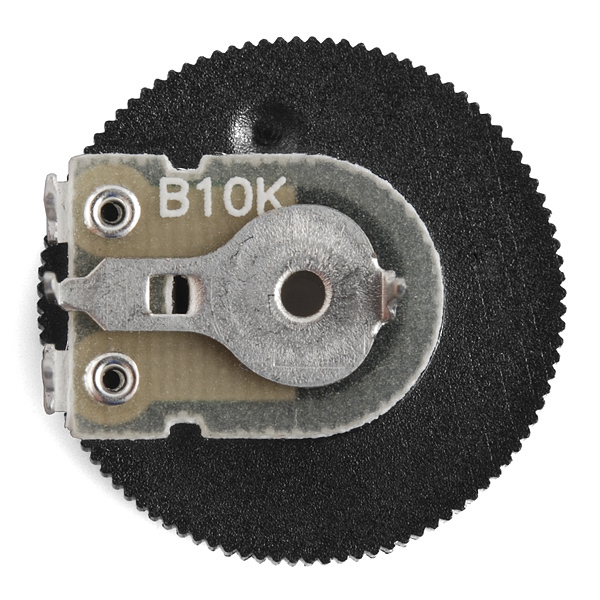 Is it possible to substitute a Slide Pot - Small (10k Linear Taper): https://www.sparkfun.com/products/11620 for this thumbwheel potentiometer? Yep - they're essentially the same thing ( 10k Ohm, linear taper ), just a different form of actuation (linear motion vs rotational motion). Your application may matter, however - a slide pot only goes from minimum to maximum as it physically just ends at those two extremes. A rotational pot can sometimes continue to be turned so that it goes from maximum to minimum (or the other way around) instantly. This particular model has a slight detent to prevent that from happening easily, but if I recall correctly you could accidentally force it past that. Would I be able to use this with the Mono Audio Amp Breakout - TPA2005D1, instead of the Trimpot 10K with Knob that is suggested? 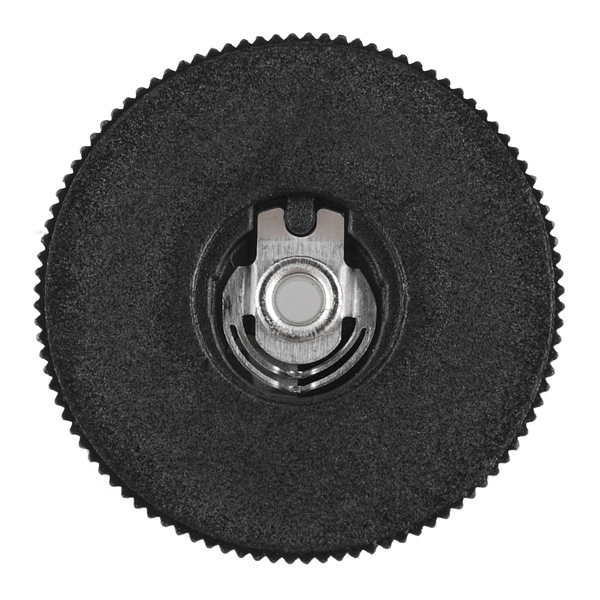 I'm looking for a thumbwheel pot like this in 100k. I can't find another distributor of this brand. Any chance you could carry them if available? How much force does it take to turn this potentiometer? Do these have positive stops at increments (clicks to keep it from free spinning) ? The rear photo kind of looks like it does. Yep, connect it like you would any other potentiometer. A single gang potentiometer like this is no good for stereo volume control (only one channel!). It took weeks to source a dual gang pot still in production. correct, and they're linear too, which isn't right for audio. That's what I was thinking, if a person's project already uses a microcontroller they should be able to control multiple channels and map this pot's resistance to a log scale. Just a bit of lateral thought and some extra lines of code is all that is required to make this a suitable volume control for something like an Arduino playing MP3s or other digitally recorded sounds. yep, this is true. but as a volume attenuator, it wouldn't be great.